US demand for post-consumer recycled plastic will rise 6.5 percent yearly to 3.5 billion pounds in 2016. Bottles will remain the leading source while other types gain market share. LDPE/LLDPE will be the fastest growing recycled resins. Packaging will continue as the top market, driven by food and beverage bottles and thermoformed containers. 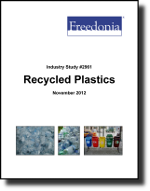 This study analyzes the 2.5 billion pound US recycled plastics industry. It presents historical demand data for the years 2001, 2006 and 2011, and forecasts for 2016 and 2021 by source (e.g., bottles, rigid plastic and foam, bags and film, carpet and fiber), resin (e.g., PET, HDPE, LDPE, polypropylene, nylon, polystyrene), and market (e.g., packaging, construction, motor vehicles). The study also considers market environment factors, details industry structure, evaluates company market share and profiles 33 industry players, including KW Plastics, Clean Tech, and Trex.